The Daily News of Open Water Swimming: Will Aurélie Muller Equal The Feat Of Thomas Lurz? Will Aurélie Muller Equal The Feat Of Thomas Lurz? Photos courtesy of Giorgio Scala of Deepbluemedia, Lake Balaton, Hungary. Not since Thomas Lurz of Germany medaled in the 5 km, 5 km team relay, 10 km races and 25 km marathon swim at the 2013 FINA World Championships in Barcelona, Spain has anyone won four open water swimming medals at a FINA World Championship. Lurz won a silver medal in the 5 km race, a bronze medal in the 10 km race, a gold medal in the 5 km team relay with Christian Reichert and Isabelle Franziska Härle, and finished his unprecedented performance with a gold medal in the 25 km marathon swim. Aurélie Muller of France is on a pace to possibly match his 4-for-4 record. She has won a gold medal in the 10 km race, a silver in the 5 km race, and a gold in the 5 km team relay this week in Hungary's Lake Balaton. Tomorrow, she will enter the 25 km race as one of the pre-race favorites. 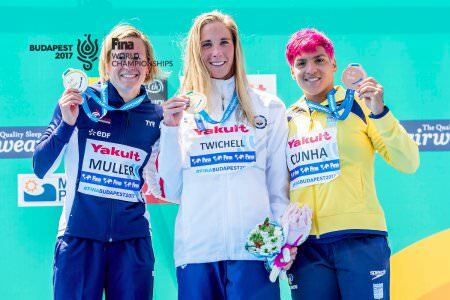 But she will also have to outdual and outsprint the who's who of the 25 km distance with 25 km world champions Angela Maurer (2011), Martina Grimaldi (2013), and Ana Marcela Cunha (2015) in the field. 25 km silver medalist from 2015 Anna Olasz and 10 km bronze medalist and frequent rival Arianna Bridi are also entered in the race. Footnote: Muller finished 8th in the 25 km race [see here].